The Eco folding timber loft ladder is designed for customers who require a high quality ladder giving easy, spacious access to their loft space without the need for obstructive mechanisms taking up valuable space within the loft area. Made from solid spruce obtained from renewable forests. 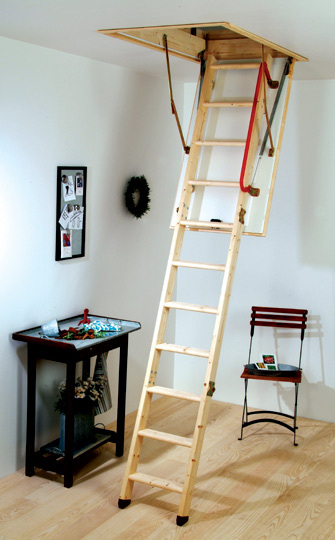 The sprung descent mechanism is located at the side of the ladder, leaving the loft floor clear of obstructions. When not in use the ladder rests above the hatch, requiring no extra loft clearance. Deep 3 inch non-slip treads for safety and comfort, Maximum safe working load 150kg Will suit ceiling heights up to 2.87m. Comes built into its own casing and measures 1.2m by 600mm therefore needs to be fitted into a new opening or an enlarged existing opening.